Rue St Jacques is one fairly long street at 1.55 km – although not quite as long as rue de Vaugirard, which stretches across 4.36 km in the southside of the city – and along it, some interesting architecture features from different periods of time, right from the medieval to the contemporary, can be found. 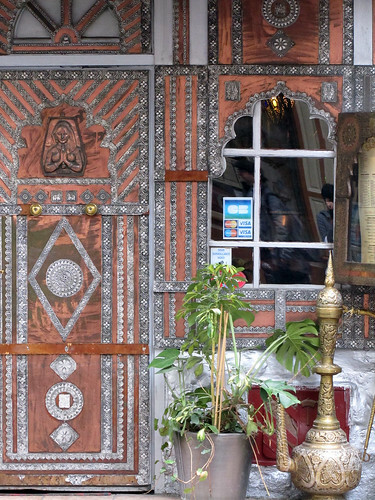 Of course, innovative restauranteur could also go one up, like this front façade of an Indian restaurant that has been elaborately decorated in the orient style. From what I gather, the theme is carried through the interior of the restaurant too. A colleague mentioned that their food is quite good, so perhaps I should give that a go sometimes soon. Day 313: Candy seller Day 315: Bashful or not?